Indian Services PMI rose to an eight-month high of 53.2 in October form September reading of 51.3. This marks fourth consecutive month of above 50.0 readings in the sector. 3mo average through October 2015 stood at 52.1, up on 49.4 3mo average reading though July 2015 and up on 50.7 3mo average through October 2014. Per Markit, “activity growth was noted in three of the six surveyed categories… Underpinning growth of services activity was a quicker increase in new business inflows. 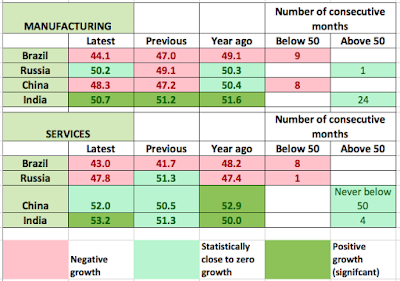 Incoming new work expanded at a solid pace that was the most pronounced since February.” In summary terms, Indian services performance improved in October, although growth rates singled remain below their historical average of 54.6. China Services sector activity rose at a quicker rate in October (52.0) compared to September (50.5) and the fastest rate of expansion since July 2015. Per Markit, however, “…the latest reading was indicative of only a modest rate of growth that was slower than the historical average. Service sector companies saw a further rise in total new business during October. In line with the trend for activity, the rate of new order growth picked up from September’s recent low and was solid overall.” That said, 3mo average reading for the index through October stood at 51.3, which is lower than 3mo average reading of 53.0 for the period through July 2015 and is down on 53.5 3mo average through October 2014. Thus, overall, China’s Services sector has managed to turn around persistent declines in PMI readings over the previous 3 months, but activity levels in October stood well below historical average of 55.2. 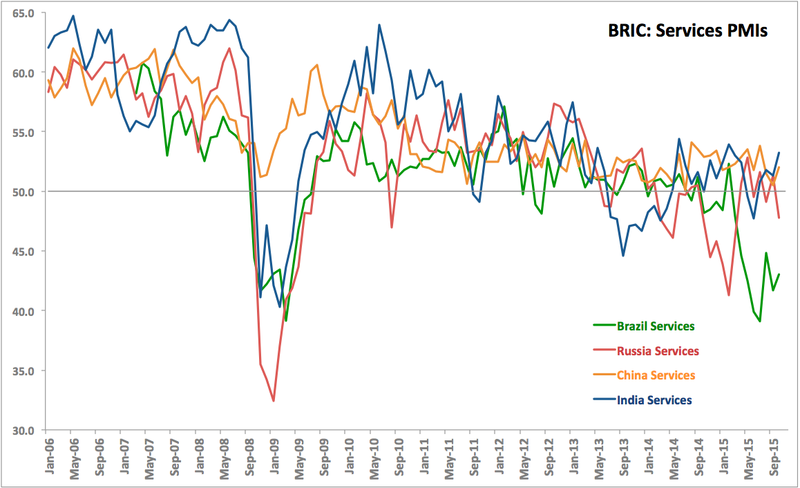 As shown above, Brazil continues to lead BRIC group into recessionary territory in the Services sectors, with latest moderation in the rate of contraction not sufficient to compensate for activity declines over the period from march 2015 on. 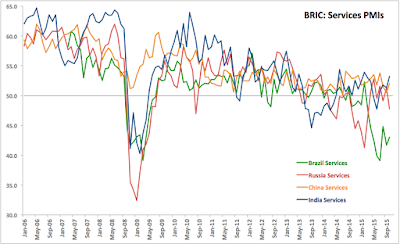 Back in Aril 2015, Brazil pushed past Russia as the driver to the BRIC group downside and it remains in this ‘leading’ position. Another disappointing signal came from Russia, where Services PMI singled renewed and relatively sharp pressures to the downside. This single is consistent with the view of the Russian economy as being well outside the bounds of the recovery momentum. In contrast, both India and China posted improvements in the rates of growth in October in the Services sector, although Chinese data is clearly subject to serious questions about its quality. 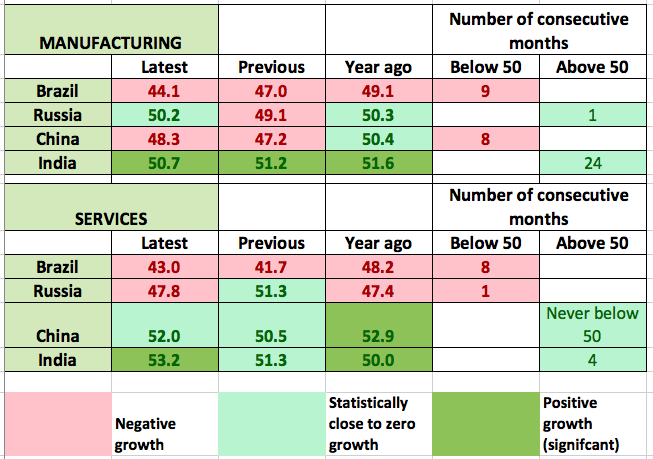 Overall, however, on a simple average basis, BRIC Services PMI cam in at around 49.0 with Manufacturing coming at 48.3, suggesting that overall growth conditions remain weak across the world’s leading EMs.